on Friday night has created a major controversy with AIADMK leaders calling it "unfortunate and regretful" but Chief Minister K. Palaniswami laid the blame squarely on the doors of V.K. Sasikala and her family for the action. The Chief Minister totally distanced his government from the raid and said it was the result of the "several mistakes" of Sasikala, a close aide of Jayalalithaa, and several of her family members that resulted in the "temple" being desecrated. Palaniswami told reporters that the IT raid in Jayalalithaa's house was a continuation of the raids that have been taking place for the last few days in the residences and properties of Sasikala and her family members in Tamil Nadu and elsewhere. "The Tamil Nadu government is in no way connected with the raids, which are being done by the Income Tax department which comes under the Central government. 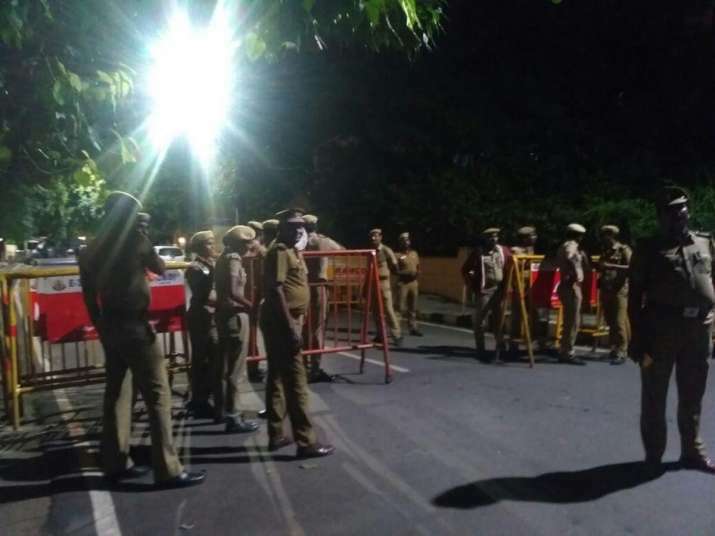 It pains us that there has been a raid at Jayalalithaa's house which we consider as a temple and the state government was in the process of converting it into a memorial," he said. He also dismissed Sasikala's nephew T.T.V. Dinakaran, asking "who is he?". "He has nothing to do with AIADMK. We are the ones in the party for over 40 years and have made sacrifices for it," he said when asked about Dinakaran's charge that it was Palaniswami and Deputy Chief Minister O. Panneerselvam who were responsible for the raid at "Veda Nilayam", where the late Chief Minister lived. Several other AIADMK leaders also said it was painful that Jayalalithaa's house was the target of an IT raid but some of the Ministers justified the action saying it was due to Sasikala's actions. Fisheries Minister D. Jayakumar said it was very painful that the raid took place but blamed Sasikala and her family for that. Forests Minister Dindugal Srinivasan said it was a routine action of the Income Tax department. However, senior leaders Dr V. Maitreyan and K.P. Munuswamy said whatever may be the reason it was painful and not acceptable. Lok Sabha Deputy Speaker Thambidurai said Jayalalithaa's residence was a "sacred" place and nothing should be done to bring disrepute to it. Dinakaran, who heads a faction of the AIADMK, called the raid a conspiracy to drive him and Sasikala out of politics. He accused the Chief Minister and Deputy Chief Minister of being responsible for the raid at Jayalalithaa's house. DMK Working President M.K. Stalin waded into the controversy seeking details as to what came out of the raid at Jayalalithaa's house and in various other places connected with Sasikala and her family. He also wondered what had happened to the raids at former Chief Secretary Rammohan Rao, contractor Sekar Reddy and some Ministers earlier this year.